Named portable NMR of the year in consecutive years! Learn more about the NMReady family of benchtop NMR spectrometers, observable nuclei, and available accessories. Learn more about who is using our benchtop NMR spectrometers, what they're using them for and what they're saying about them. 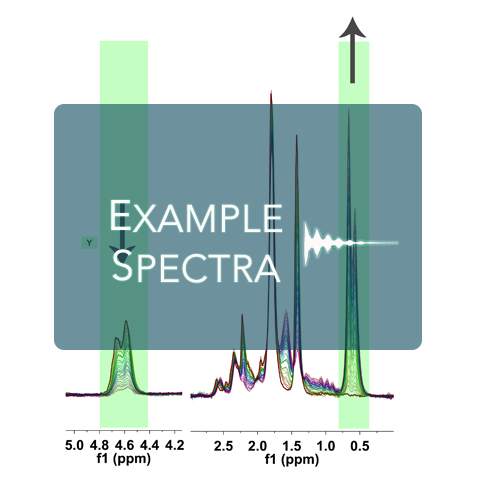 Explore our growing library of 60 MHz 1H, 11B, 13C, 19F, 29Si, 31P, 1D and homo- and hetero-nuclear 2D NMR spectra. What types of applications can a benchtop spectrometer be used for? Will 60 MHz multinuclear NMR work for your application? Nanalysis Corp. is the world-leading manufacturer of compact, portable, benchtop NMR spectrometers. Headquartered in Calgary, Canada, we are an NMR company that manufactures industry-leading portable desktop NMR instruments for a variety of applications across many market sectors, including biotech and pharma, polymer research, food science, environmental science, oil and gas and more. Our revolutionary benchtop NMR spectrometer, the NMReady-60, allows chemists, researchers, engineers, and students to perform spectroscopy tests wherever and whenever they need. Whether you are in the lab or in the field, the NMReady-60 portable NMR gets you the spectroscopy data at your point of need. Explore our selection of NMR spectrometers for sale to find the right benchtop spectrometer for your applications. Contact Nanalysis with any inquiries you may have, or click here to request a quote.